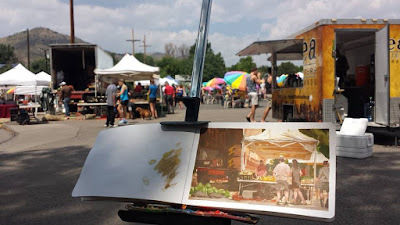 In last month's Outdoor Market Challenge I asked you to paint a market on location using just three colors of gouache plus white. 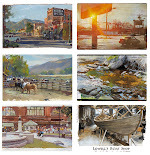 We had many inspiring responses from artists around the world, ranging from seasoned professionals to people just starting out on the adventure of painting. In this post I want to spotlight a few of the results that I thought made the most of the opportunity, but I was impressed with everyone's effort, and grateful to all who participated. 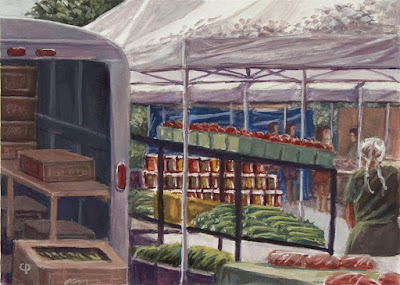 It was really hard to select the winners, but I would like to give the Grand Prize to Jesse Winchester Schmidt, who painted "Sunrise Market." He says, "Sunrise is a well known market in downtown Vancouver. Always vibrant, buzzing with diversity." The striking color scheme came from using Indigo blue, Cadmium yellow, Permanent Alizarin Crimson and White. 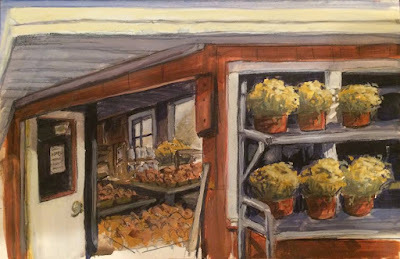 Jesse painted the main piece in over four sessions, but he also produced more than a dozen preliminary sketches and paintings to help him warm up to the challenge. Jesse is a senior instructor from the Vancouver Film School. I hope his students see what an impressive example he is setting. 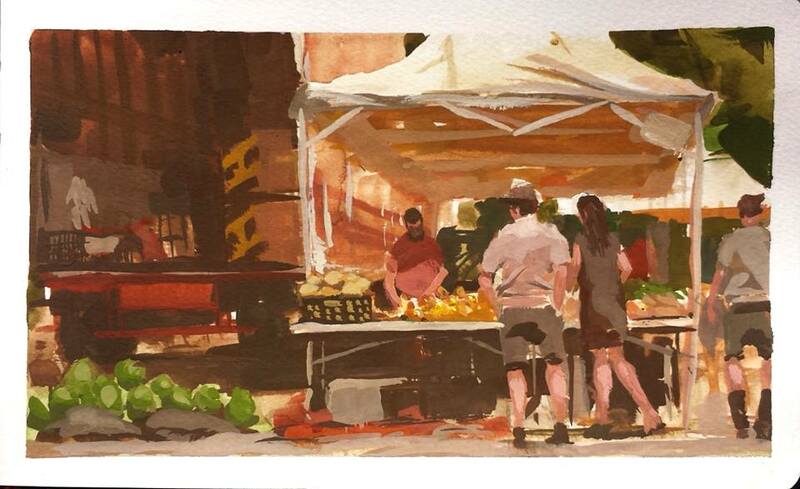 Next up is Finalist Jared Cullum of Richmond, Virginia, who painted Virginia's Historic 17th Street Farmer's Market. He used Cadmium Red, Yellow Ochre, Cobalt Blue & White. The perspective is very carefully drawn, the colors are muted, and the values are well grouped, making the piece look like it was done by a 19th century master. The next Finalist is Clay Brooks of Denver, Colorado. 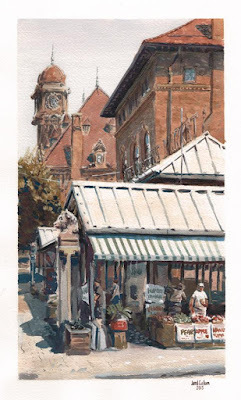 He used Venetian Red, Oxide of Chromium, and Cadmium Yellow Pale, plus white. Those colors led to a harmonious and unified color statement, with the darks related to the tints. I also like the way he handled the figures with just a few color planes stated very directly, since the figures must not have stood there long. Clay said, "I was a little upset with my color choices in the beginning because it was impossible to get darker than 2 or 3 on the value scale. Also, subbing green for blue was interesting." 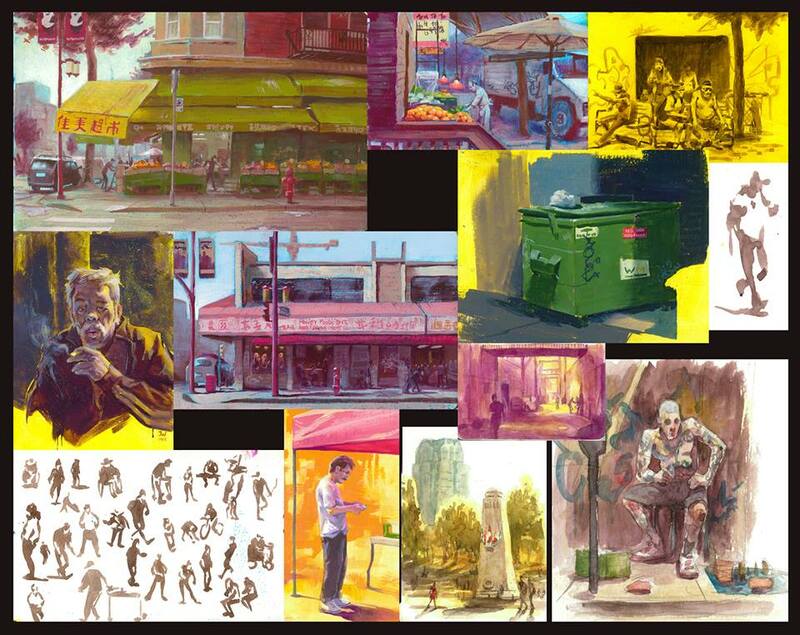 Architectural illustrator Jeff Simutis is another Finalist. 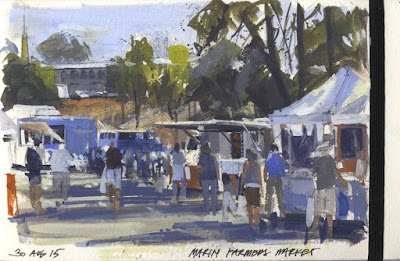 He painted the Marin Farmers Market in San Rafael, California using Ultramarine Blue, Burnt Sienna, Cadmium Yellow, and white. I love the way he echoes the colors and shapes throughout the picture and captures the bustle and energy of the whole scene. 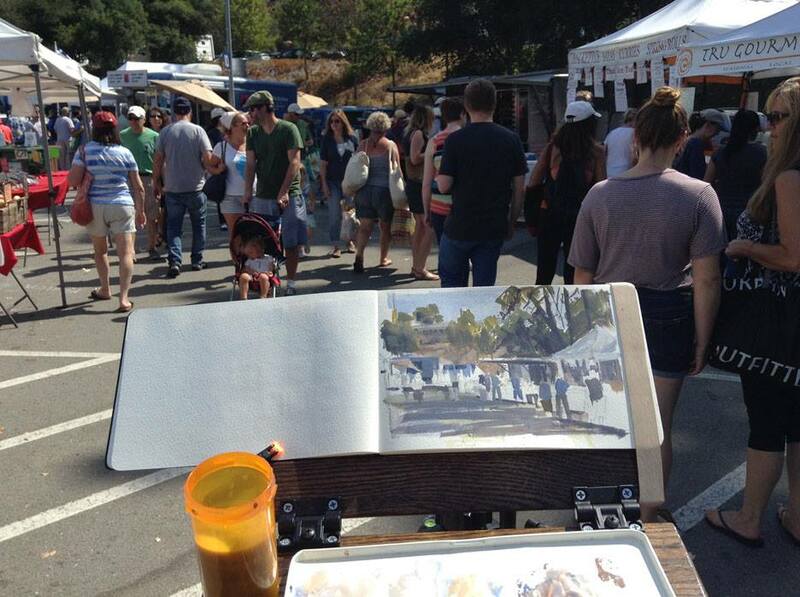 This photo captures the busy scene that Jeff was facing on his standing tripod easel. You just know he must have had a million people coming up to him and offering comments, or saying "Paint me in! Har har!" First up in the Honorable Mention category is Christian Schlierkamp of Berlin, Germany. He used Cyan, Magenta and White on a yellow priming and watersoluble pencils in a Moleskine Watercolour book. 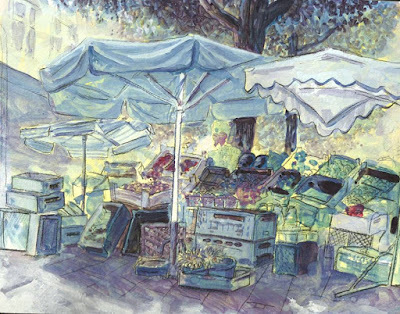 I like the light and airy feeling that he achieved, letting the yellow color come through here and there, and allowing the line work to show. Here's the view back toward Christian from the stand. 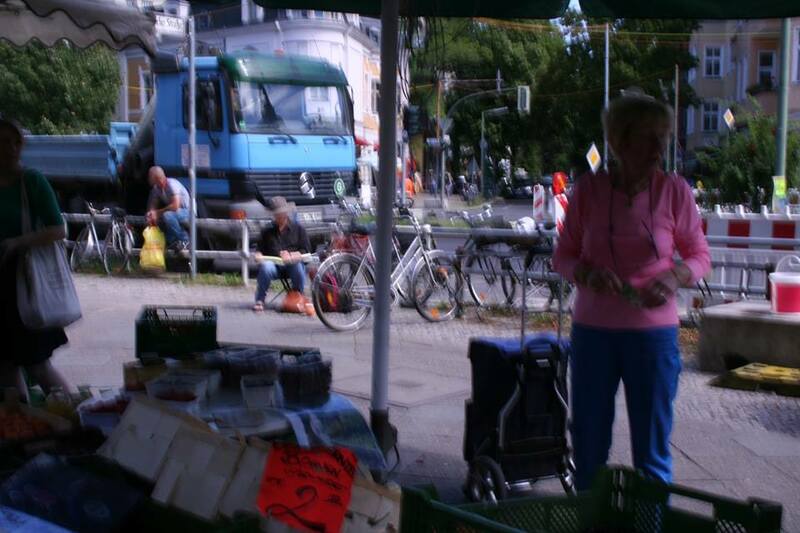 Christian says, "The market stand shown is of my friend Horst Siegeris where I buy all of our fruits and veggies." The next Honorable Mention is Michael Mrak, painting the Ort Family Farmstead Near Chester, New Jersey. He chose an interesting view looking in the corner doorway and up under the eaves. The palette was Yellow Ochre, Ultramarine Blue and Venetian Red. 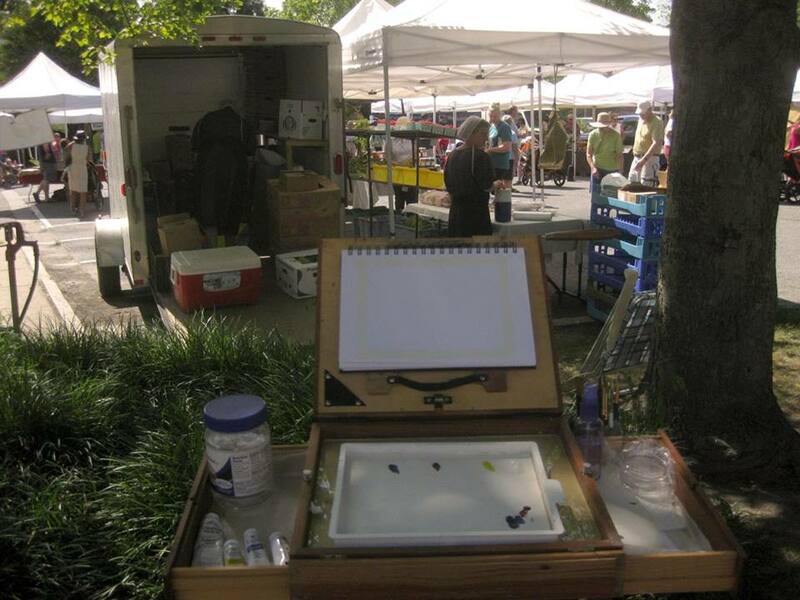 Mike says, "It has been maybe 20 years since I limited my palette like that." 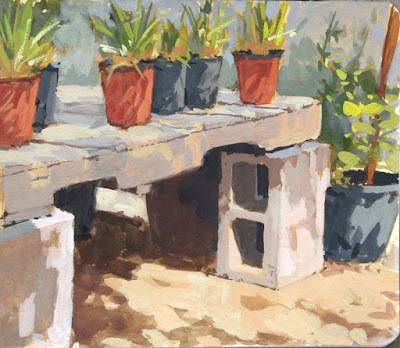 David Auden Nash painted this study using Vermilion, Sepia, and Ultramarine with an acrylic underpainting. The color statement is very exciting indeed. 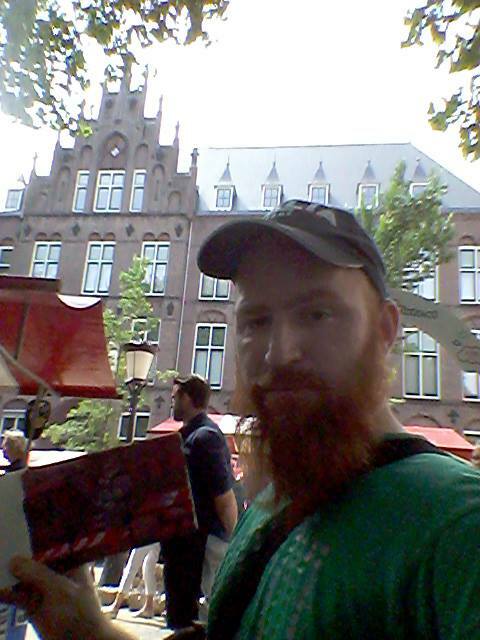 Here's David Auden Nash in front of De Streekmarkt at Mariaplaats in Utrecht, Netherlands. 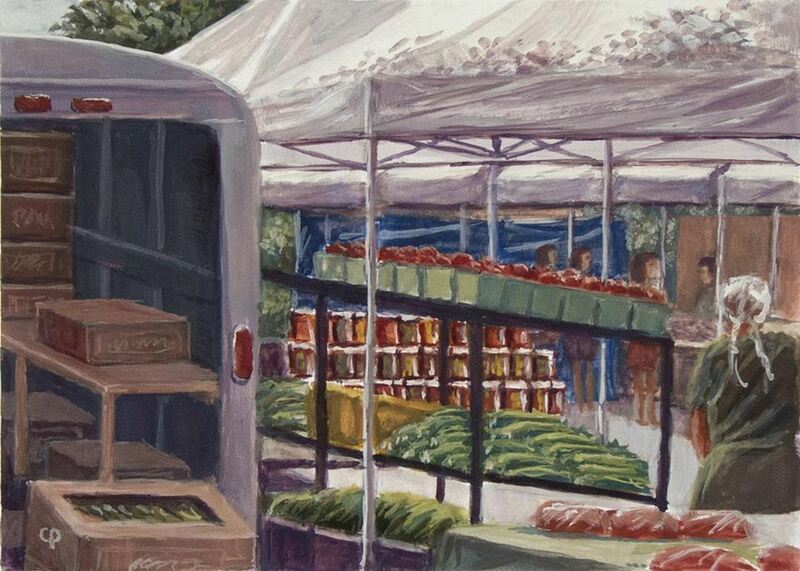 Charley Parker painted the Swarthmore Farmer's Market in Swarthmore, Pennsylvania. 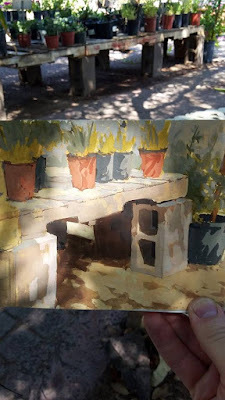 The painting is 5"x7" and is painted in W&N gouache (Ultramarine Blue, Cadmium Yellow Pale, Perylene Maroon, Permanent White) on a Stillman & Birn Zeta Series sketchbook. Charley says, "I frequently use a limited palette, but one that includes at least four colors — usually Ultramarine Blue, Cadmium Yellow Pale, Alazarin Crimson and a "helper color" like Burnt Sienna or Viridian. I didn't realize how much I depend on that helper color, which for a subject like this would have been Burnt Sienna. 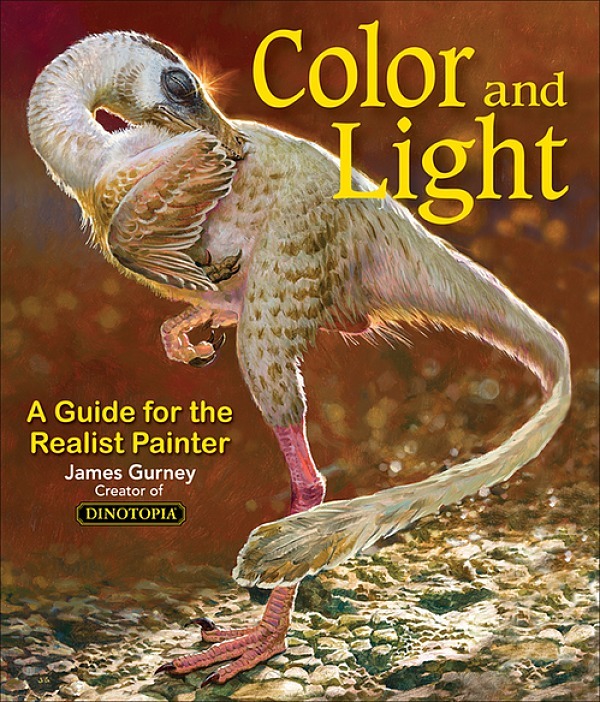 I would use it primarily to combine with Ultramarine to make grays and browns and to dull the bright yellow into ochre-like tones." 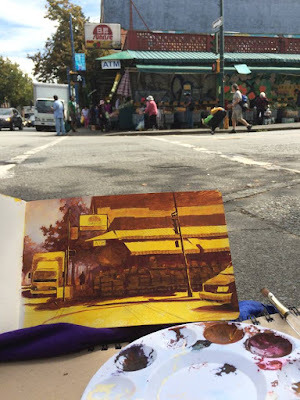 He continues, "I usually paint more natural landscape forms as opposed to cityscapes and artificial structures, and I'm not a particularly fast painter. I soon realized I'd taken on more than I could paint in a single session. Fortunately the weather cooperated and I was able to return to the same location under similar light conditions." 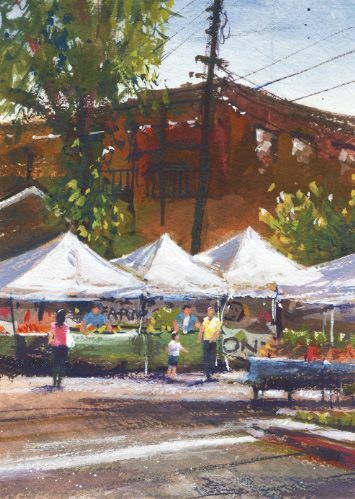 Sherry Schmidt painted the South Pasadena farmer's market in California with W&N Ultramarine, Alizarin Crimson, Lemon Yellow, and white, on cold press watercolor paper. She says, "I taped over the other colors in my gouache palette so I wouldn't make a mistake! 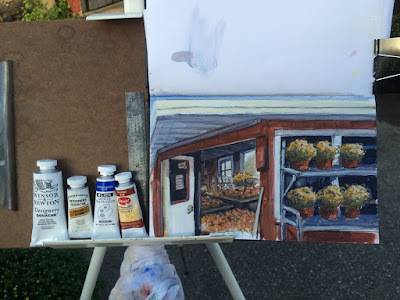 I enjoyed trying this and finally felt more comfortable as I got used to mixing with the three colors." Finally, I'd like to spotlight the work of Matt Sterbenz of Arizona. I like the way he focused on a smaller detail of the scene, and did a nice job capturing the flickering light and shadows. 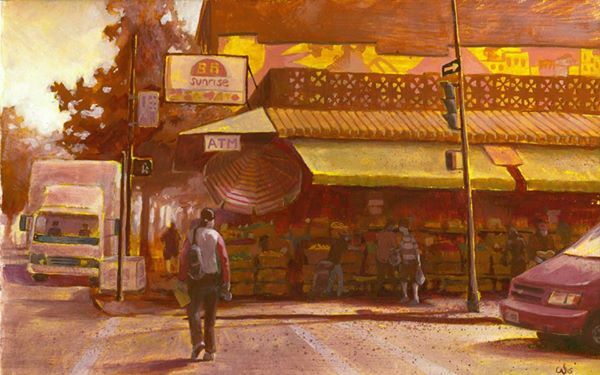 He used lemon yellow, burnt sienna, ivory black, and white. Matt says, "A couple friends and I went to a Scottsdale nursery this morning. They have lots of benches and tables set up throughout the garden. The shelving there was made from old pallets and cinder blocks. Hiding from the sun in the shade, I painted this display of small bushes with Holbein gouache." Have a look at the Facebook Event page where all the entries are posted. 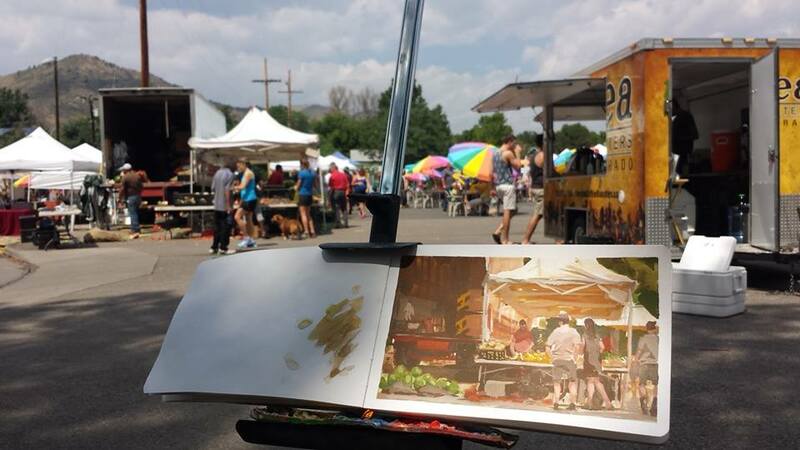 My compliments to everyone who joined in, and hats off to those of you who bravely painted outside for the first time, or painted in gouache for the first time. Jesse, Jared, Jeff, and Clay, please contact me to let me know where to send your official "Department of Art" patch as your prize. 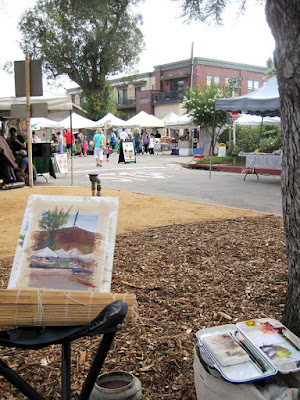 Original blog post about the Outdoor Market Challenge. Luke and Diane, you bet, this was fun. I'm thinking of ideas for the next challenge, and I expect to announce it in a few days. Everyone's entries look great! 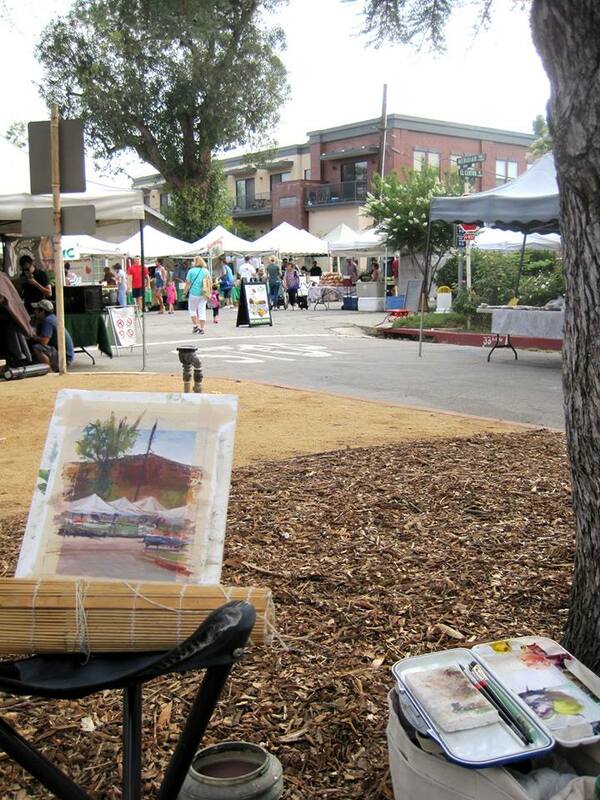 Congrats to Jesse, as soon as I saw the market I said "I know that place!!' Nice work everyone. Everybody's work on this was astounding. This turned out to be a great challenge for everyone. Thanks for the opportunity! One thing that struck me was Jared Cullum's note about how they were going to destroy his market the very next day - is it just me, or does anyone else notice that this exact situation seems to happen a lot to urban sketchers? I follow several urban sketchers and other artists' blogs, and I've seen this exact statement more than three times in various cities, with nearly identical conversations with onlookers. Isn't it odd that so often an artist will get out there and unknowingly pick a location where demolition is going to happen THE VERY NEXT DAY? Terry, I have noticed the phenomenon about how sketching something seems to prefigure its demise, and I've talked to a lot of other artists who have noticed the same thing — to the point that we're now calling it the "Kiss Of Death Syndrome." But I refuse to believe there's really any cause and effect, or else I would never want to do another portrait. I think what really drives the phenomenon is that sketching something heightens our awareness of it, and we're more likely to notice and feel the loss of things we've drawn. Terry, that's interesting. I hadn't noticed it until I posted that and then began to meet other painters with the same story. 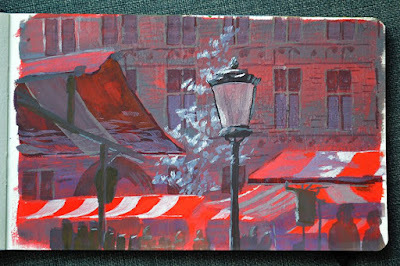 I was actually planning on painting the market the next week but that day opened up. That would have been pretty disappointing. The contest got me into sketching some of these old buildings. I grew up in DFW, Texas in a really rapidly expanding suburb neighborhood. Richmond is full of interesting old buildings and a lot are being replaced by new buildings for the college here and other stuff. It's an interesting place, though, [Richmond, VA] and I don't think they'll ever completely wipe out it's old-timey charm. In that case, maybe painting locations doesnt curse them...but artists have a spidey sense to go pay homage to places before they are gone! Jesse, I tend to your idea...I wonder if maybe artists have unconsciously picked up on news articles about a neighborhood icon falling tot he wrecking ball, and have "chosen" the site without realizing that. 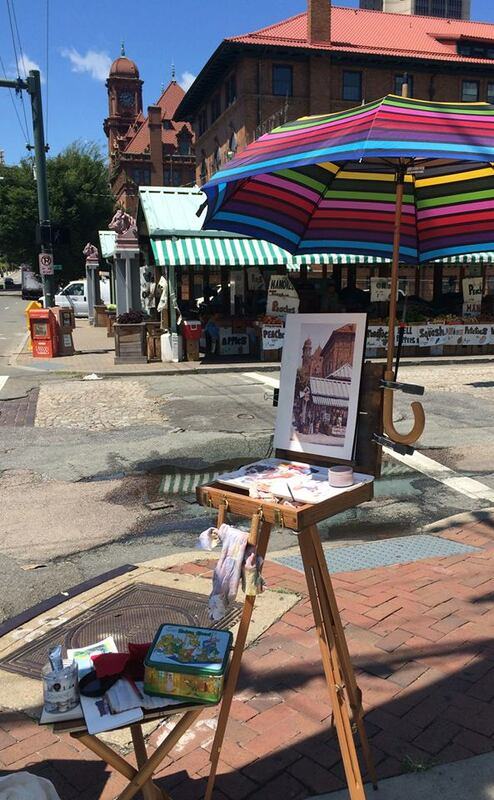 In any case, though it's sad to lose beloved old buildings, it's good there is an ever-growing army of urban sketchers out there recording their beauty and personality! 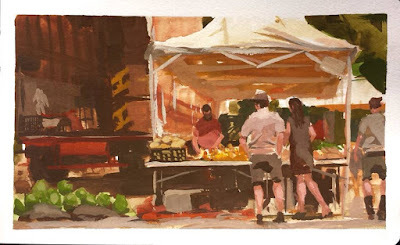 The only reason I didn't participate and instead chose to watch this from the sidelines is I've never worked with gouache but gouache is on my wish list to learn. Viewing James painting demos and after observing the work from folks participating in these competitions, I'm going to buy a decent starter set and give it a whirl myself.